This happened to a personal friend of mine today, Candace Setosta at Gulf Islands Water Park. I have copied her exact words about the incident below. So, today we went toGul Islands Water Park…. As a breastfeeding mom I always think of where I can feed my baby anytime we go some where. Well Max was hungry as soon as we got there… I went up to one of the employees and I asked if they had a particular place for me to feed my baby. She said, no. I said that I breastfeed and asked, “so, I can just feed him anywhere?” She said yes, then I asked if someone complained if I could just come get her, she said yes that was fine… So that is what I did the first time I sat at a picnic table next to the “cafe” and as I was feeding Max an entire family sat down and ate with him lol… I really don’t think they knew I was breastfeeding because I am pretty discreet. The second time I fed him we were in the baby/kids area under a slide for shade in the water. An older lady complimented me on how beautiful he was as he ate… Unfortunately, the third time I fed him was in the “cafe” area… We all sat down at a table and ate and of course Max got hungry too lol… Well this time I was sitting feeding him and my sister and friend took two of the 5 children we had with us to get dipping dots… At this point I was alone feeding Max and I had a 3 year old and a 6 year old sitting at the table with me… Two older women walked up to me one was the supervisor, they asked me to cover my baby with a towel to feed him… Mind you its 91 degrees and 100% humidity here in south Mississippi… I nicely told them no it was really hot and I would not put him under a towel… Then I was asked if I would unlatch him and go to her office… Again I said no, I’m not going to UNLATCH him and take him to your office to eat… I reminded her that legally I can feed my baby anywhere I choose… She then said that I shouldn’t feed him in the “cafe” in front of all the other children… Because families were “offended!” At this point I was not very polite anymore… I said, “yeah, because heaven forbid we teach our children that breast have a biological reason for being here… They are not sexual objects they were designed to feed our children!” (Very loudly in hopes that whoever complained could hear me!) She then informed me that she breastfed (because that makes this situation better) and asked me to face the fence to feed him… I asked, “seriously? You want me to face the fence? Seriously?” Well at this point a nice gentlemen sitting at the table next to me began to get aggravated with the situation as well… Luckily he came to my defense, because a teenage boy walk by saying, “You need to go somewhere, No one wants to see that!” Then the same gentleman told him “No, you need to go somewhere she is feeding her infant!” Thank God he was there… Because I was upset and almost almost in tears… I am so glad he and his girlfriend were there to defend me… It was awful! I have a few issues with the whole situation… 1) even though the “supervisor” said several times she wasn’t trying to be rude and that she breastfed… Her demeanor and tone came off extremely rude… 2) legally I can feed my baby anywhere I please and I was extremely discreet and last but certainly not least 3) we were at a freaking water park!!!!! Everyone in that place was half dressed… Some people’s bathing suits showed more than I did while feeding my baby! What should have happened… When the “person” (most likely the teenage boy) went to the supervisor to complain is, she should have told him legally I can feed my baby anywhere I chose… And that if he is sooo offended he can either move, or better idea eat your hamburger and not stare at her and her son while he’s eating!!!!! Because that is terribly rude! I added a the picture below to show that while max is eating you see no more than you what you see while I’m in my bathing suit!!!! Yet again, a breastfeeding mother has been discriminated against, but this time in the incident happened inside a Victoria’s Secret in Texas. Of course it’s fine to show your breasts…just not if there is a baby attached to it! This brought of memories of my own experience when my local BIG Latch On group was asked to leave our local mall for breastfeeding. We were sitting quietly in the play area when a security guard told us that we had to leave. When we informed him that we were protected by law to feed our babies anywhere we need to, he argued that because we were on private property, the law didn’t apply. Anyway, just yards away were Victoria’s Secret posters that exposed MUCH more skin than any of us! One mom in our group was even using a cover! The Mall at Barnes Crossing repeatedly apologized, and Victoria’s Secret issued a statement apologizing to the mother, but this brings up the serious issue that businesses need to inform their employees of the law protecting breastfeeding mothers BEFORE things like this happens! A mother shopping at the Victoria’s Secret store at the Domain says she was denied the right to breastfeed. Instead, she was told to go to an alley. But that wasn’t the case for one mother who came to us in disbelief. Now she’s hoping other women don’t have to go through what she had to. Ashley Clawson had just finished spending $150 at Victoria’s Secret. But she left with more than she bargained for. “I was humiliated by the whole thing, I immediately called my husband,” Clawson said. On Monday afternoon she asked an employee behind the counter if she could nurse her 4-month-old son in the fitting room. It was the response she got that came as a shock. “Said no, you cannot nurse your son in our fitting room but you can go outside to the alley and nurse him there, no one usually goes there,” Clawson said. After clarifying with the employee what was said, she knew it was no misunderstanding. “I don’t even know what alley she was talking about. I didn’t explore it because my son. Obviously if you’ve been around a baby… once they start crying there is no going back,” Clawson said. Once she got home, she posted what had happened on Facebook, getting more support than she could have ever imagined. “Some of these people I’ve been getting friend requests from I have no clue who they are and people who have shared it on their page, their friends have shared it, and they’ve tagged certain groups that I never even knew existed,” Clawson said. She filed two complaints before being told she would be receiving something in the mail. Clawson now has a different perspective on the company. “The posters and everything are just women showing their breasts and obviously to Victoria’s Secret in my eyes, it’s looked at as a play toy. Not necessarily, means for you know nursing your child, which is why we have breasts to begin with,” Clawson said. She is hoping this situation can be used as an example for change. “I do think that Victoria’s Secret needs to train their employee’s better on the breastfeeding policy and know the laws on it,” Clawson said. I have tried to contact Mrs. Clawson & will update when I get a chance to speak with her. In the meantime, I encourage you to call or email Victoria’s Secret and let them know the importance of informing all of their employees of the laws protecting breastfeeding mothers. All it takes is a simple note on a bulletin board or by the time clock, people! Get it together, businesses! The contact page for Victoria’s Secret is here. As World Breastfeeding Month comes to a close, I’m reflecting on all of the things that have occurred this month….the positive & the negative. As the month started out with amazing events such as the BIG Latch On that bring awareness to the importance of breastfeeding & helps to normalize it, which is vitally important as evidenced by the countless women who were discriminated against this month as they fed their babies in public and was asked to cover or to leave. Texas mama Lucy Eades was harassed by an employee at her local gym for nursing her days old baby. This harassment was captured on video by her husband and Lucy received support from around the country after the video went viral on the internet. See it here. Only a couple of days later, my own La Leche League group was asked to leave our local mall by a security guard because we were breastfeeding in the play area at center court. My post about it on Facebook received 20,000 views, shares, likes, and comments before it was removed by Facebook the following day. See the media coverage here. and Pa.laa’s coverage here. Fortunately, in both of these instances, an apology was issued and policy changes have occurred due because of them. Unfortunately, not all breastfeeding harassment cases have been so positive. Just in case you missed the American Airlines incident, in which a mother was asked to cover & then offered hush money (a whopping $100!) to keep quiet about the incident, read blogger Paa.la’s in-depth story here. This should not be happening! Although breastfeeding mothers are protected by law to breastfeed wherever they need to, there are no provisions in place to enforce these laws, which means that until there are, there are no real consequences for businesses harassing or discriminating against mothers. This will not stop until there are real consequences! 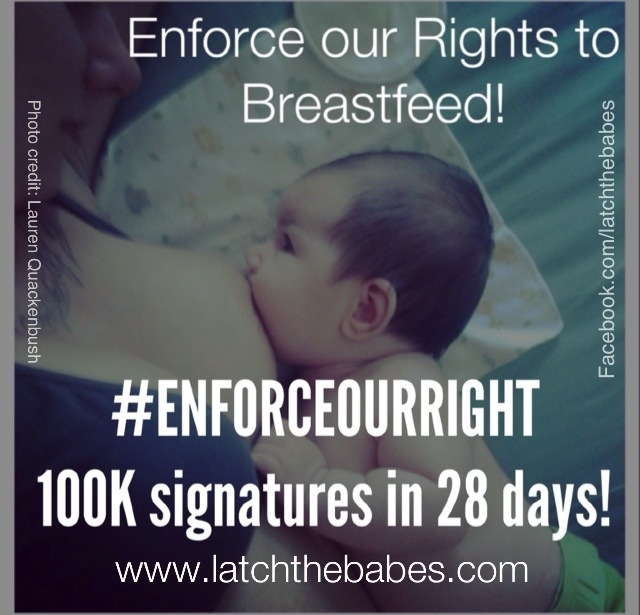 Lauren has started a White House petition urging them to put in place provisions to fully protect breastfeeding mothers rights, and offer consequences to those who do not adhere to the laws that are already in place. See the breastfeeding laws by state here. Our goal is to get 100,000 signatures by September 27th. It’s a tall order but we CAN DO IT! Fully protect a woman’s right to breastfeed her child in public, including full enforcement provisions for that right. Most states (though not all) have laws stating that a woman is free to breastfeed her child anywhere, public or private, that she and her child are otherwise allowed to be. However, with the exception of a few states (CT, DC, NJ, VT, & WA), there exist no enforcement provisions. This means that as soon as a woman who is legally breastfeeding her child is asked by a business owner or security to leave, she is then trespassing. Other countries (i.e. Taiwan, the UK) have fines for those who would interfere with a woman’s right to breastfeed; the US should as well. A woman should not be forced to hide, whether under a fabric cover, in the restroom, or in her car, simply because she elects to breastfeed her child. At its core, this is an issue of discrimination and should be treated as such. Please help us by signing the petition! And by sharing on Facebook, twitter, and Instagram by hash tagging #ENFORCEOURRIGHT & by helping us to spread the word! We need full protection from discrimination! Thank you from the bottom of my heart for the support that this community gives other women!